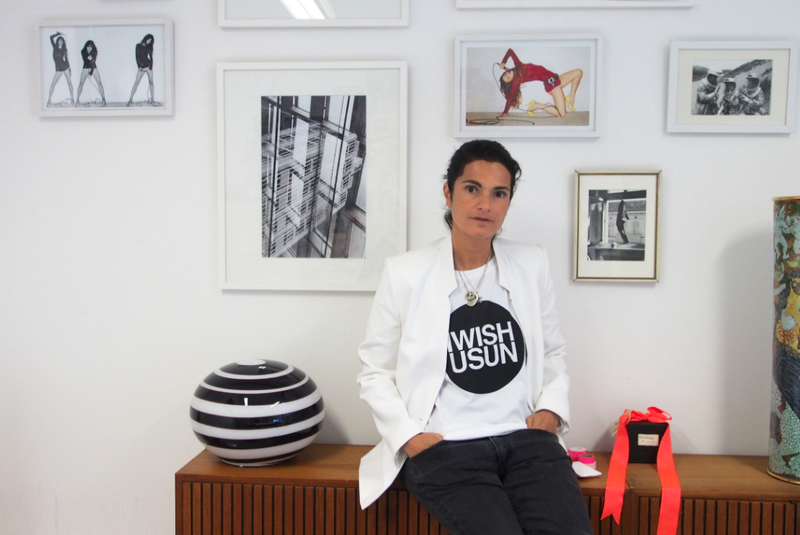 It’s almost 10 years ago that Leyla Piedayesh has founded her label lala Berlin. After resigning from her job as an editor at the music station MTV, a new period of her life began with a simple find at a flea market: knitted wristlets. She began to knit some herself and shortly thereafter lala Berlin was born – a label that has turned knitwear fashions inside out, that is characterised by noticeable combinations of cashmere, baby mohair and silk and that turned Leyla Piedayesh into one of Germany’s most famous and successful designers. Needless to say that we didn’t want to miss her clothes in our wardrobes, but we found a supporter in Leyla Piedayesh as well. Welcome! Which sense is more important to you, touch or sight? If I really had to decide – sight is more important to me personally. I am an extremely visual person – I love the power and the significance of colours for example. And you simply can’t touch colours. Colours have a special meaning to me and are not only incredibly important in my work, but also for me personally. You’re a creative person. What vision motivates you in your work? The creation of new things and turning new ideas into reality. Creating something new that has never existed before in that way. It is not just the one vision, but every season there is always new inspiration and a new vision to go with it. It’s exactly that constant variety that I like; that is my driving force. Of course an overarching theme is the vision of lala Berlin – creating a look that is modern but also cool and relaxed and representative of Berlin. As well as some monochrome looks your collection is defined mainly by striking colours and eye-catching prints. How important is the visual power that exudes, for you and your work? There is a definite focus to every collection – also in terms of colour. I have a whole load of fun playing with colours and prints. But I do try to create new effects by working with colour contrasts or unexpected colour combinations. Striking, in part eccentric colours and expressive prints have simply become the trademarks of lala Berlin. And privately? Do you prefer eye-catchers or a more restrained look? In private I prefer mainly to wear my own collections – but I style them in my own personal way. I don’t like styling that’s too obvious, but on the other hand an extremely minimalist look is not my thing either. In brief: I go for restrained eye-catchers. How and where do you find the inspiration for new motifs and patterns? That depends: for example I get a lot of inspiration from my direct environment. The city in which I live and work is an important source. My young daughter also inspires me a lot with her ideas and preferences. Children can really fire up your imagination with their carefree ways. But often inspiration comes quite by chance. Knits and silks are to a certain extent constants in your collection, in terms of material choices. Where and how do you find your materials? At various textile trade fairs. There I can allow myself to be inspired by the most varied materials, nations and people. Of course I love to discover new things, unusual things and soak up the inspiration. There should be give and take in all our actions, starting with my daughter down to my co-workers. It shouldn’t really be necessary to think about it. It’s a done deal – everything is give and take. What is your tactic to improve the world we live in? Having a consciousness. About what we do, and what we consume. I may not be able to change the whole world like that, but it’s a step in the right direction. My daughter – of course. Happy laughing people around me, who don’t have a beef with everything and everyone. Having a good mood simply motivates, and it’s contagious: high spirits should be part of every day life, not just privately, but at work as well.